I was recently asked about what role data plays in email marketing. Here, I’ll share some insights about how marketing teams use data and analytics to design, manage, and review email marketing campaigns. Q: How much of the marketing effort now relies on data? 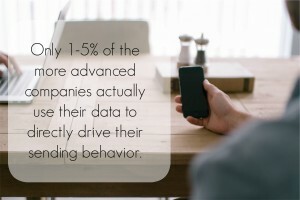 marketing campaigns we see that while senders could be looking at their open rates, only 1-5% of the more advanced companies actually use their data to directly drive their sending behavior. Ultimately, email and marketing data should be used ahead of sending an email marketing campaign. Q: How is this data gathered? 2) Once you click on a link through your email you are automatically redirected to the website. However, as you’re being redirected the information is sent to your email delivery platform before you reach the retailer’s website. Customers don’t normally see this because it takes fractions of a second for that information to be sent before going to the actual retailer’s website. Q: Who analyzes the data? A: Your email delivery platform analyzes this data. They can track all the metadata of every email you send. They can also track other events like bounce back rate, unsubscribes, etc. Even though your email delivery platform analyzes the data, it’s important that marketers are analyzing the data as well. Q: Is a “data-driven” culture baked into the marketing organization, or does more work need to be done? A: A lot of work needs to be done. I expect it will happen in the next couple of years. Marketers need to start baking data insights into their marketing strategies. For example, if you’re a daily deal sender and a specific customer doesn’t engage with your email within 60 days, then we recommend you remove them from your email lists to prevent being marked as spam. To do this automatically, you need to build a model to determine engagement frequency, which in effect, is one way to bake a data-driven culture into a marketing organization. Q: What kinds of results are now being seen as a result of data-driven marketing? A: The most enlightening result is seeing how skewed the value of an email recipient list is, in terms of difference between the highest and lowest levels of engagement. There has been an incorrect assumption for some time now that the most engaged recipients are just 2-3x more engaged than less engaged recipients. This assumption directly leads to bad sending strategies. 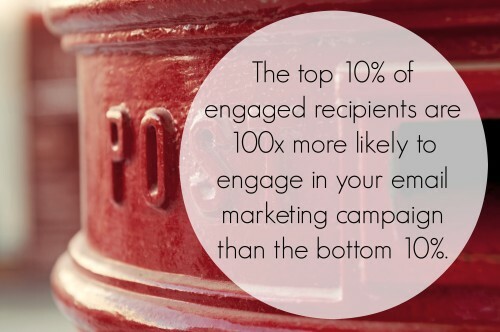 The truth is, the top 10% of engaged recipients are 100x more likely to engage in your email marketing campaign than the bottom 10%. By recognizing this, marketers will see that sending strategies can’t be one size fits all. Data has the biggest impact when you point out these variations which enable you to understand that outliers and extremes are the norm, not the exception. Q: What are some of the challenges that need to be overcome? A: One of the challenges is determining the difference between a good email marketing sender compared to a bad email marketing sender. Current email providers like Yahoo and Google are using algorithms to track email engagement and determine if they are going to deliver the email to the inbox or to the spam folder. Instead of fixing the problem by using data to enhance and add value to their email marketing campaigns, many marketers are trying to find loopholes in the algorithms which allow them to fake a good email so it gets delivered. Meaning, at the moment, it’s really an arms race. Q: Are there areas in which “gut-level” decision making still makes sense? A: There is absolutely still room for intuition and gut-making decision. Decisions should be data driven. For example, when sending to recipients of different levels of engagement, there are different levels of frequency you should send to them, and this should be data driven. How the email looks (colors and pictures) should be left to the creative teams. As soon as you assume data is going to solve all of your problems you are going to miss something that the creative teams can bring to the table. Whatever decision data tells you to make, hold it up against the light of human reason.